One reason we love living in Charlottesville, Virginia, is the wonderful local food movement in this region. Many readers will recognize our neighbor over the mountain, Joel Salatin of Polyface Farms, the most famous farmer in America. Michael Pollan featured him in his splendid The Omnivore’s Dilemma, and he has since been chronicled in the feature documentary Food, Inc. Not many localities can boast that the local Chipotle serves pork straight from Polyface (though I recently read that Mr. Salatin is in the process of adding a second Chipotle location in the DC area). But Charlottesville is a locavore’s town, and the local food movement in this area is much bigger than Polyface. The Charlottesville Farmer’s market is a Saturday morning standby for many, and has given birth to I believe three additional farmer’s markets in the area throughout the week. There are lots of local producers, many of which are organic or biodynamic or similar, and many of which offer CSA’s (community-supported agriculture, an arrangement in which the consumer purchases a share of the CSA in the early spring in exchange for a weekly delivery or pick-up of vegetables, and sometimes eggs, meat, or even flowers). Many restaurants here feature local food, and there is even a local food hub, to help connect farmers, restaurants, and consumers. Probably my favorite local food perk is an annual event called Meet Yer Eats, organized by Market Central, the same non-profit organization that organizes the farmer’s market. On Labor Day each year, about 20 area farms open their doors for tours and farm activities, all for the price of one very reasonably-priced ticket. My family tried it last year for the first time. We had such a great time, we intend to make it an annual event as long as we are in this area. My father grew up on a farm in the Midwest, and I have very fond memories of visiting my grandparents’ farm as a child. I remember facing my fear of heights when I was probably nine by climbing to half way up the silo. I helped build sun shelters for hogs in the field and herd full-grown sheep into pens for shearing when I was maybe fifteen. I’ll never forget the smell of the hay in the barn or swinging on the big long gate as it opened. That’s all fine, but the farm was sold off long before I had kids, and we don’t have any family that farms. In other words, I have no easy access to farm life other than tourism and experiences like Meet Yer Eats. 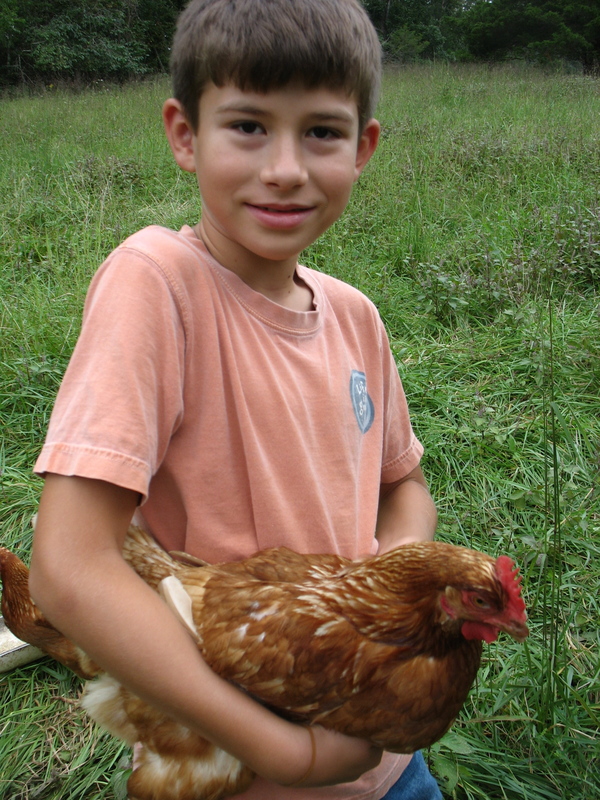 It is so valuable for kids to connect farm life with food. The idea that most people only identify food with a grocery store or with a labeled box is scary. When we lose the understanding of the food system and the bounty of the farm, we lose an important part of our humanity, not to mention the knowledge necessary to sustain us. So, wherever you are, seek out a local organic producer. If you are lucky enough to be in a place that has annual tours or similar events, go out of your way to visit a farm. Your kids will thank you for it. Ours did — after a long day of holding free-range hens and ducklings, studying bovine culture in a meadow too green for words, and inspecting veggie-filled fields from atop a tractor. If you’re not blessed to live on a farm, have you taken your kids to one? Do you participate in a CSA? What other ways do you help your kids connect with the sources of our food? Do you garden? Raise chickens? Categories: Have Fun, Sustainability | Tags: Community-Supported Agriculture, Joel Salatin, kids on farms, Meet Yer Eats, Michael Pollan, Omnivore's Dilemma, Polyface Farm | Permalink. Market Central organizes the tour, yes — but we’re a non-profit “Friends of the Market” organization for the Charlottesville City Market. The market is operated by the City of Charlottesville’s Parks & Recreation department – they’re the ones who manage all the day to day operations of the City Market. Thanks very much for the clarification, and thanks again for organizing the Meet Yer Eats farm tours. Market Central is a great asset to the Charlottesville community!